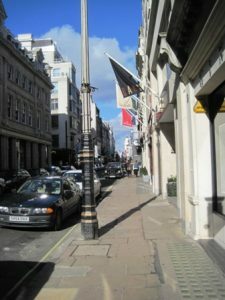 Bond Street is a top-end shopping street in Mayfair well known for its jewellery and fashion boutiques. It has been a fashionable shopping street since the 18th Century. Bond Street runs north-south between Oxford Street at the northern end (where it is called New Bond Street) and Piccadilly at the southern end (Old Bond Street).